For a bit of traditional style in your bathroom, choose this beautiful vanity. Its comes with a nice white marble counter and grey solid wood base for strength and style. Put a nice twist on your bathroom project with this classic piece from Avanity. Designed with a traditional style and strong build, this vanity is a perfect choice for any bathroom. Its beautiful white marble counter and grey solid wood base bring a great new look into your bathroom. Bring a classic look and feel to your bathroom with this beautiful set from Avanity. 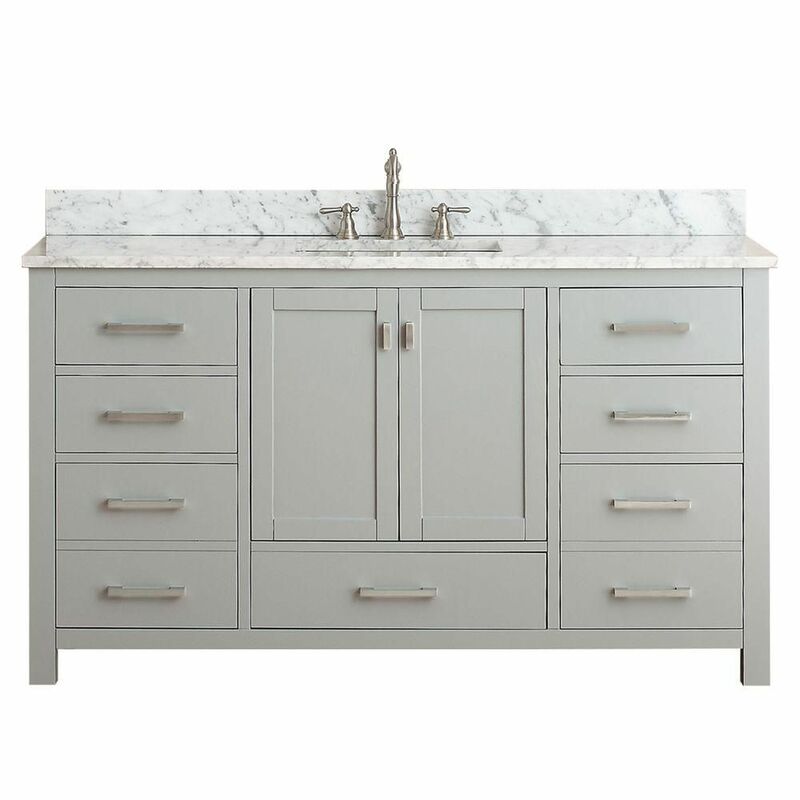 A Grayish Blue finish accents the elegant detailing and solid poplar construction of the Kelly 61-inch vanity combo. Kelly's furniture grade styling and generous storage space can be paired with the matching Linen Tower, providing ample practicality and panache to your bathroom space. This combo includes a sturdy carrera white marble top and white vitreous china sink. Modero 61-inch W Freestanding Vanity in Grey With Marble Top in White For a bit of traditional style in your bathroom, choose this beautiful vanity. Its comes with a nice white marble counter and grey solid wood base for strength and style. Put a nice twist on your bathroom project with this classic piece from Avanity.